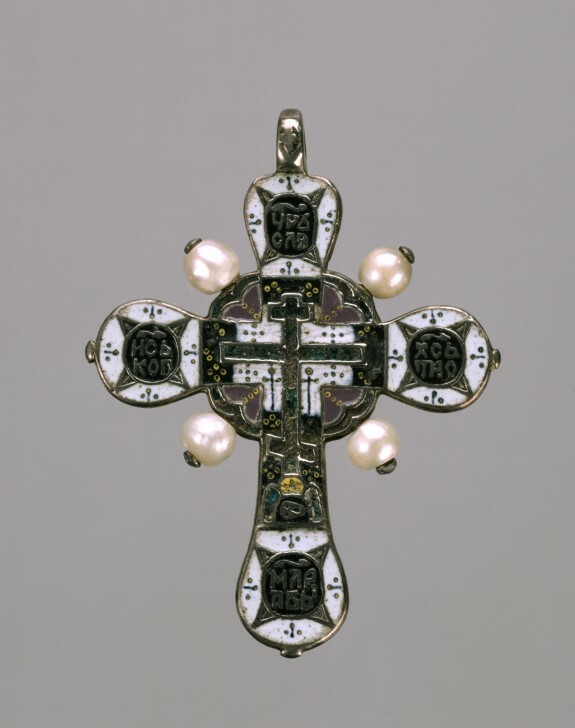 Description This cross depicts at its center a second small cross of the Crucifixion, flanked by miniature representations of the lance and sponge, instruments of Christ's Passion. The skull below suggests the name of the hill - Golgotha (place of skulls) - and also refers to the legend that Christ was crucified on the site of Adam's tomb. The Church Slavonic abbreviations on the cross arms stand for "King of Glory" (top), "The Place of the Skull Became Paradise" (bottom), "Jesus Christ" (left and right), "Lance" (left), and "Sponge" (right). Provenance Henry Walters, Baltimore, by purchase; Walters Art Museum, 1931, by bequest.